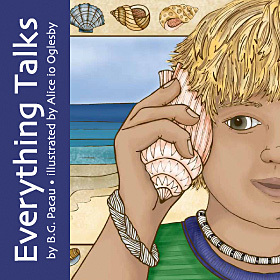 book design Archives - Page 2 of 2 - io design & illustration, inc.
Everything Talks: You Just Have to Know How to Listen is the second book for children that I’ve illustrated. As the title suggests, the book is about sounds in the world around us. The goal of each illustration is to help evoke the featured sound visually. Color, layout and incorporation of text into the illustration were all key to giving each page it’s sound. Here in Asheville the book is available from Spellbound Children’s Bookshop and will soon be available at many other locations. The book is published by Back of a Mouse Books, a division of Blue Throat Publishing. Some pages from the book are shown below.